Here you go sneaker heads, the latest Retro Jordan to hit stores. 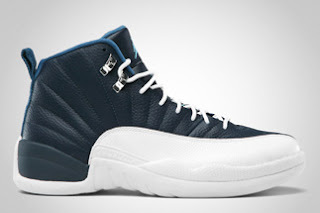 Not much releasing today but these Obsidian/White Retro 12's. Not to discredit these babies at all because I'm sure much like it's Retro 12 "playoff" colorway, these boys will fly off the shelves as well.